Why visit the Sunrise Lakes? If Tenaya Lake, which lies at the trailhead, is too vast and spectacular for your tastes, hike on past - you'll find this trio of pocket-sized lakes less crowded and more to your liking. Difficulty: 6 out of 10. The first mile and a half is mostly level, and the stretch from the trail intersection to the lakes themselves is also relatively gentle. In between, though, you'll gain a thousand feet in about a mile via a seemingly interminable series of rocky switchbacks. If you're a strong climber, this is where you can break away from the peloton and make your run at the polka dot jersey. Crowd Factor: Medium. On the first part of the hike, you'll share the trail with hikers on their way to Clouds Rest and Yosemite Valley. Once you take the fork to the Sunrise Lakes, you'll see people headed to the Sunrise High Sierra Camp. There's plenty of room for everyone, though. Scenery: Considering that the trailhead is at the fabulous west end of Tenaya Lake, and that all three Sunrise Lakes combined are less than half the size of Tenaya Lake, you might find yourself weighing the virtues of just hanging out at Tenaya, especially about a mile and a half into the hike, once you start up the switchback-laden climb to the trail juncture. However, if you'd rather wander through Ikea a room at a time than face the overwhelming all-at-once acreage of a furniture warehouse, you might have the temperament to appreciate the bite-sized portions of lake around each corner that you'll find with the Sunrise Lakes hike. The lakes are among the smallest in Yosemite, but still pretty. They're ringed by granite outcroppings, though these are smaller and more domelike than the sheer peaks that contribute so much to the scenery at May or Cathedral Lakes. Best time to visit: There's no particular time that outshines all the others; lake scenery tends to weather changes of season well. If you're there before August, you may get to see lots of wildflowers en route. If you're there just after the Tioga Road opens, though, there could be enough snow left to make it difficult to find the trail. Nearest Bathrooms: Hole-in-the-ground toilets at the trailhead. The nearest plumbing is at the Tuolumne Meadows Visitor Center, five miles (8 km) east. Nearest Snacks: At the grill & convenience store near the eastern end of Tuolumne Meadows, 5 miles (8 km) east. Getting there: The trailhead is at the west end of Tenaya Lake; look for the lot with the "Sunrise" sign. Tenaya Lake itself is on the Tioga Pass Road near the eastern end of Yosemite National Park. From Yosemite Valley, take highway 140 northwest for 10 miles (16 km) up out of the valley to the Crane Flat junction, where the Tioga Road begins. Turn here and take the Tioga Road 31 miles (50 km) east to Tenaya Lake. From Yosemite's eastern entrance at Tioga Pass, take the Tioga Road west for 16 miles (25 km) to the western end of Tenaya Lake. Parking: There's a lot at the trailhead that holds a dozen or so cars. It's usually full, and cars will fan out along the shoulders of the road for a hundred meters or so in either direction (watch for the no-parking signs, though). Here's a Google Street View panorama of the trailhead parking area. Trail Notes & Hazards: 2.7 miles (4.3 km) into the hike, just as you've finished climbing a gnarly series of switchbacks, you'll reach a fork in the trail. Going straight will take you to Clouds Rest, another 4.7 miles (7.5 km) ahead. Turn left to go to the Sunrise Lakes instead. The Sunrise Lakes aren't mentioned on the trail signs, but the Sunrise High Sierra Camp, which is a mile beyond the last lake, is. You'll reach the first lake in about half a mile, and the other two are each spaced another half mile apart afterwards. The first and third lakes are right on the trail, but the second lake will be off to your left, about a hundred meters off the trail. The view is partially occluded by trees, so keep a sharp eye out or you might miss it. You'll have to leave the trail, obviously, to get a closer look. 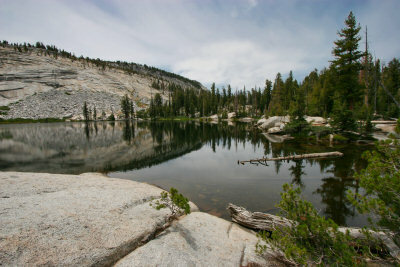 Right after you begin the hike you'll have to cross the Tenaya Lake outlet. For most of the hiking season you can rock-hop across, and in some years it dries up altogether. In the first few weeks after the Tioga Road opens, though, you'll probably have to wade it, and it can be deep enough to make you thankful for dry-fit shorts and underwear. If you share water allergies with the Wicked Witch of the West or your mother told you not to get wet, you can avoid this problem by parking at the east end of Tenaya Lake and hiking around the far side of the lake to meet the trail, adding an extra mile each way to your hike. You'll still have to cross the Tenaya Lake inlet this way, but you can usually find a log crossing there.